Today’s Flash Friday post is written by Denise Harrison. Each Friday, I invite a guest to share something personal: Some way they’ve balanced ambition with happiness; achieved a personal goal; and/or a way they have converted an idea into action. If you have a story you’d like to share in a guest post, please contact me here. Not a super-fast, top in my age group, award-winning runner. 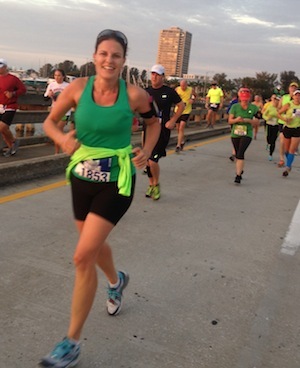 I’m a middle-aged mom running a few times a week for my health, to clear my mind, and to energize my day. Like many working mothers, I am constantly trying to find that perfect work-life balance. I’ll admit, some days I’m more successful than others. Running three days a week, four to six miles, over and over and over can become monotonous – especially if you have been doing it for 20 years. Sometimes you have to kick it up a notch, set some crazy goals, and sign up for a race or two just to keep it interesting. In my 20s I ran because it was a relatively quick workout and running in Central Park was free! All I needed were my shoes and my Walkman music. I could run pretty much anytime, anywhere. It wasn’t until I turned 30 that I decided to challenge myself. So with youthful exuberance, my best friend and I signed up for the NYC Marathon. We really had no idea what we were taking on. We just knew we were “lucky” to win numbers in the Marathon lottery and there was a 16-week training program we had to follow. Four months later, we ran the NYC Marathon (in the rain)! It really was the hardest thing I had ever accomplished. But the feeling of crossing the finish line was euphoric. Not so euphoric that I wanted to do it again . . . but no one can take that accomplishment away from me and, to this day, I can say I am a marathon runner (one time does count)! Running a marathon gave me the confidence and true belief that if I worked hard and created a plan I could accomplish anything. And I did: I advanced in my career rapidly, married my long-distance sweetheart (he lived in San Fran, I lived in NYC), relocated from NYC to Florida, had two kids, returned to work, then left the corporate world to freelance, and, most recently, transitioned to work with my husband. None of those life challenges was as tough as running a marathon . . . although childbirth came close. So I had run a marathon; it was checked off my bucket list. My running soon slowed down and became an occasional thing. I took a few years “off” to have two kids. I started up again with a friend of mine after I turned 40. We invited friends to join us and before long, we had a regular Saturday running group. It’s fun to run with friends, to talk, laugh and get a work out in. It holds us accountable but it’s also our chance to connect, and chat about current events, marriage, motherhood, work, and LIFE! Soon, we started signing up for races. Why not run the Disney Half Marathon? Before I knew it, we were running half marathons regularly. In 2010, I stopped to count how many I had run: 22! Wow, how did that happen? I’m now at 33 half marathons and have mapped out a plan to run my 50th before my 50th birthday in March 2017. 50 by 50 is my new mantra. It keeps me focused on the number of races I want to run every year. It forces me to wake up early and run before taking my kids to school. It makes me run more consistently. It makes me accountable. It makes me keep a promise to myself. And, it even has me looking forward to turning 50. That euphoria I felt after finishing the NYC Marathon is the same way I feel after finishing every race. I’m one race closer to my goal. I can cross it off my list. I can add another medal to my collection. I can feel a sense of accomplishment. I can start to look forward to the next race. You know what has happened? I have started setting larger, more far-reaching goals for myself, my family, and my business. Once I started, it became contagious. 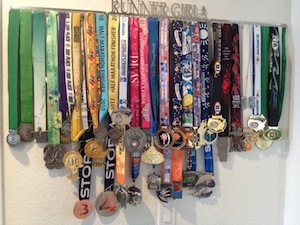 What has running taught me? To dream big. Create a timeline. Tell your family, friends and Facebook. and just start. Denise Harrison is a Marathon runner (1 time DOES count!) and WILL run 50 Half Marathons before she turns 50. She is also a partner with www.RobKellerMD.com, an online nutritional supplement company dedicated to enhancing your health, boosting your immunity and increasing your athletic performance. You can email her directly here. P.S. Lisa has promised to join her in one of those half marathons. There. It’s out there. So? What’s your big goal? We’d love to hear from you in the comments below. Very cool – that will be a good one. Do you know where it will be? Denise, I enjoyed reading your article. I want you to know that you inspire me with your positivism and determimation and most of all your great attitude. I have learn so much from you and I am proud to call you “my friend”. I hope I get to be part of your cheering squad when you cross that “50 by 50” finish line !